Chylothorax is a relatively rare condition in the cat in which lymphatic fluid or chyle accumulates in the pleural cavity. The pleural cavity lies between the lungs and the inner lining of the chest wall. Normally, only about a teaspoon (5 millilitres) of clear fluid is present in this space. The purpose of the fluid is to keep the surface of the lungs lubricated so that they do not adhere to the chest wall. When chylothorax is present, up to a quart (litre) of fluid may be present in this space. 1. A pleural effusion is present. This means that an abnormal amount of fluid has accumulated in the pleural space surrounding the lungs. This accumulation limits the cat's ability to expand the lungs completely, forcing it to breathe rapidly and shallowly. In some cases, this condition leads to respiratory failure and death. 2. The normally clear fluid in the pleural space has been replaced by chyle, a milky-white fluid from the thoracic duct or ducts. This unique fluid forms from lymphatic drainage of the intestinal tract, and is high in triglycerides, which gives it a distinct color and chemical composition. Normally, the thoracic duct transports chyle to a large vein called the cranial vena cava for further processing by the body. With chylothorax, the chyle drains into the pleural space instead of the cranial vena cava. Are some cats more likely to get chylothorax? 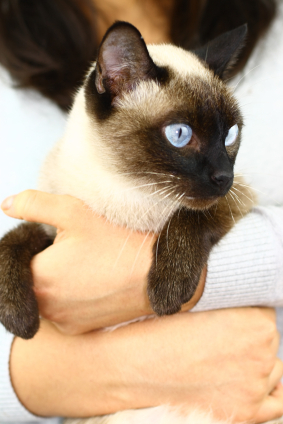 Purebred cats, especially the Siamese and Himalayan breeds, may be at increased risk for developing chylothorax. Male and female cats appear equally affected. What are the clinical signs of chylothorax? The main clinical sign of chylothorax is labored or difficult breathing. Some cats appear to be "holding their breath" because there is a delay between inspiration and expiration. Interestingly, coughing is often the first sign of chylothorax in some cats. Coughing is not normally reported with other causes of pleural effusion. This can be an important indicator of chylothorax because there are relatively few causes of coughing in the cat as compared to the dog or human. "If the fluid slowly accumulates in the pleural space, the cat is able to adapt or compensate until the condition becomes life threatening." In some situations, clinical signs of the underlying disease such as a tumor or heart failure may overshadow those of the pleural effusion. Occasionally, owners note no abnormalities other than depression or exercise intolerance. This occurs if the fluid slowly accumulates in the pleural space, and the cat is able to adapt or compensate until the condition becomes life threatening. In some cases, chylothorax may be caused by trauma or by increased pressure within the thoracic duct or vena cava. Trauma may cause the thoracic duct to rupture or become 'leaky'. Automobile injuries or falls from a tree or window that injure the chest cavity are the most common causes of traumatic chylothorax. Increased pressure within the thoracic duct or vena cava may occur due to congestive heart failure, heartworm infection, fungal disease or chest tumors. If the cause cannot be identified after appropriate diagnostic procedures, it is called idiopathic chylothorax. More than 50% of all cases of chylothorax are in this category. Thoracic radiography (chest x-ray) - This test will confirm the presence of fluid in the chest cavity but does not characterize the type of fluid. Fluid analysis - A small amount of fluid is removed from the chest cavity via a chest tap or thoracocentesis. First, the fluid color is noted. Chyle is typically white or light pink in color. Next, chemical tests can be used to determine its triglyceride (fat) content; if it is high, the fluid is most likely chyle. Finally, when examined under the microscope, it will contain large numbers of lymphocytes, a type of white blood cell commonly found in lymphatic fluid. Once the presence of chylothorax is confirmed, additional tests will be performed in an attempt to identify an underlying cause. Such tests may include blood work, including tests for feline leukemia virus (FeLV), feline immunodeficiency virus (FIV) and heartworm disease, additional chest and abdominal radiographs, thoracic ultrasound, echocardiography (cardiac ultrasound) and testing of the fluid for evidence of bacterial or fungal infections. "Treatment is first directed at stabilizing the cat by restoring normal breathing." Treatment is first directed at stabilizing the cat by restoring normal breathing. Fluid can be drained from the pleural space with a syringe and needle. In almost all cases, the fluid will reform within twenty-four to seventy-two hours and a chest drain will need to be surgically placed to facilitate daily drainage. This drain may be left in place until chyle accumulation stops. A supplement called rutin may be a beneficial treatment in some cats with chylothorax. It is thought to stimulate cells called macrophages to remove the fat in the chyle, and may reduce the amount of fluid accumulation. Rutin is available at pharmacies and health stores. .
A low fat diet is generally also recommended to lower triglyceride levels. 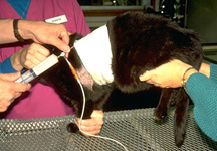 Feline chylothorax is a disease under active research. Several new treatments may be on the horizon. Regardless, the most successful therapy will be directed toward treating the underlying disorder. What complications can occur from chylothorax? Chyle is irritating to the heart, the lungs, and the tissues covering the inside of the chest cavity. If chyle has been present in the chest for several weeks, adhesions or scar tissue may begin to form around the lungs and heart. This scar tissue contracts and compresses the lungs making it impossible for them to expand properly, causing a condition called fibrosing pleuritis. Radiographs reveal lungs that are rounded instead of pointed and inflammatory cells become prominent in the chest fluid. An ultrasound examination often clearly demonstrates the adhesions floating in the chest fluid. 1. Breathing is stabilized. The cat must be able to withstand the initial diagnostic procedures and placement of a chest drainage tube. The accumulated fluid severely compromises respiration. Unfortunately, some cats die before sufficient fluid can be removed to improve their respiratory status or shortly thereafter due to irreversible damage caused by the fluid. 2. The underlying disease is identified and successfully treated. In many cases, an underlying disease cannot be identified. In cases of idiopathic chylothorax, the prognosis is usually good if the fluid production can be controlled. 3. The underlying disease does not recur. Chylothorax is likely to recur if the underlying disease cannot be identified and treated. When this is the case, the cat must be closely monitored for return of respiratory difficulty. 4. The chylothorax is resolved before fibrosing pleuritis develops. Once fibrosing pleuritis is present, the prognosis is grave, even if the underlying disease has been successfully treated.